Latham manufactures and supplies a complete range of high quality access covers, external drain covers, and raised drain covers. Manufactured in either aluminium or stainless steel, the covers and liners offer many benefits over similar products fabricated from cast-iron or steel. 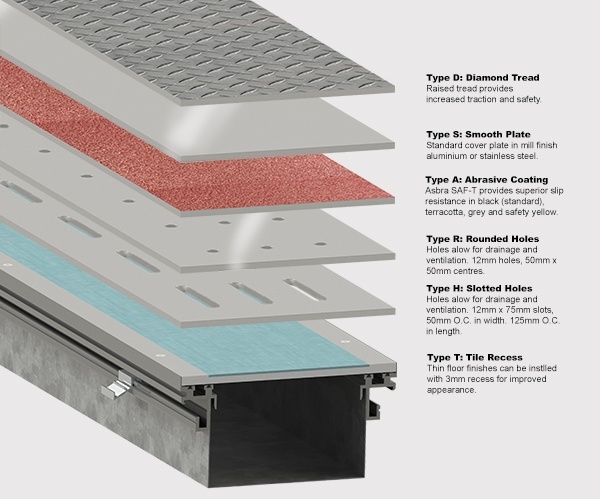 The aluminium cover plates are lightweight, corrosion resistant and visually appealing. 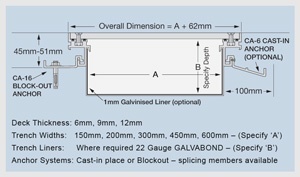 Optional trench liners simplify installation and offer improved performance. The systems can be cast-in place or set into a preformed recess. All covers include vinyl seals, which cushion against rattle and serve as a moisture/fume barrier. L atham is aware of the complex layouts that can be involved in floor services such as those required in medical or scientific buildings. We are able to work with architects and engineers to address these complex designs, offering access cover systems specifically designed to meet the requirements of each project. Custom made access covers and liners are available to suit most applications and access covers can be specified with the same plates that are available for trench covers. Where wide covers are required or heavier loads are expected, Type S, Type A and Type T are available with stainless steel covers.